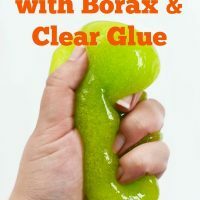 Home » How to Make Slime with Borax and Glue. The Fast & Easy Way! Do you want to learn how to make slime at home? Find out how to make a Fun, Easy and Gooey Slime with glue and Borax! When I worked as a teacher we used to have an annual “slime” science project with the kids. I always looked forward to making this homemade clear slime! In fact, that is how I was first introduced to Borax. Whether you’re looking for a fun project to do at school or at home, making a slippery batch of DIY Slime is sure to please even the pickiest audience! This also makes an awesome homeschooling science project! *Please note that children should be supervised when playing with and making Borax slime. Borax (sodium tetraborate) can be toxic if inhaled or ingested. 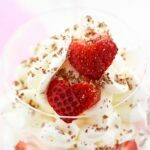 Adults should prepare this recipe just to be safe. Wearing plastic gloves is also an option to prevent any possible skin reactions when making it and playing with it. 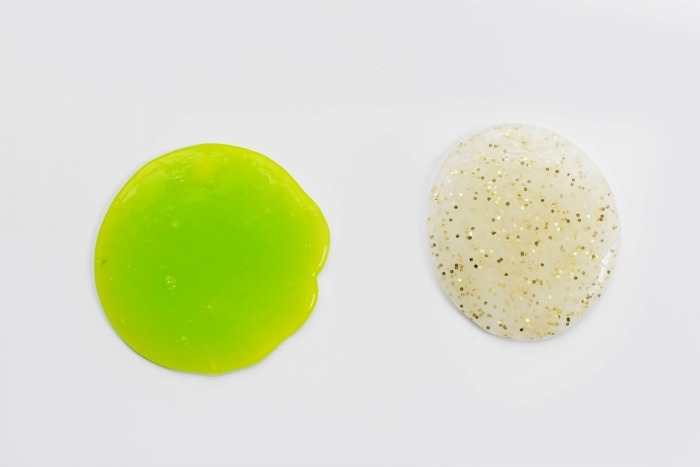 Food coloring, glitter, sequins, or whatever else you want to capture inside your Borax slime. The ingredients for clear slime and solid slime are the same except for the glue. All other ingredients and steps are the same. 1. Mix 1 teaspoon of Borax into the cup of warm water. Mix it until it’s fully dissolved. The water should appear clear and not cloudy. 3. Grab your mixing bowl. 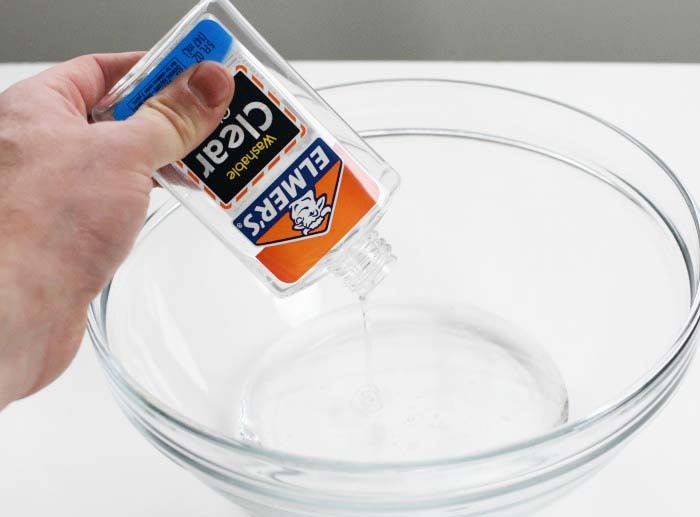 Add your 1 cup of clear glue into it. 4. Add food coloring (a few drops) and/or glitter to the clear glue and stir gently to combine. 5. Slowly… add your Borax solution into the clear glue mixture. Add only small amounts at a time while stirring thoroughly, or your slime will harden and you’ll end up with a rubbery mass! You probably won’t need it all. Only add enough until the slime isn’t sticky anymore. 6. Knead and squish the slime with your hands to finish mixing. Once you realize how fun your slime is to play with, you’re probably done mixing! Congratulations, you just made slime! 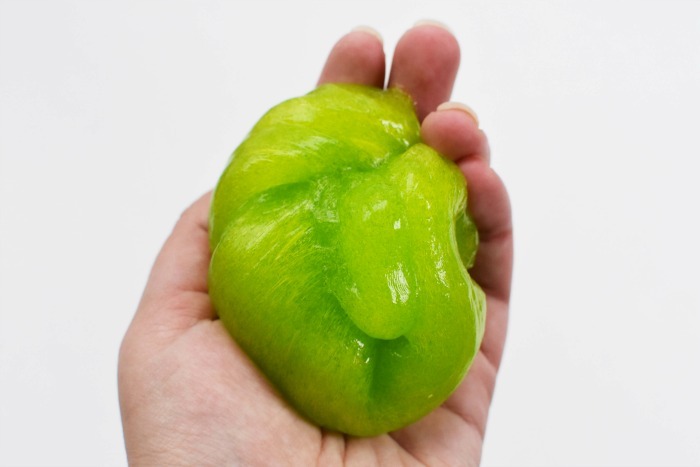 You can pull, twist, stretch, and squish your slime. Just don’t eat it because the Borax is toxic. Plus, it probably tastes gross anyway! What went wrong with my slime? If your slime is too sticky, add some more Borax and water solution until it’s not sticky. 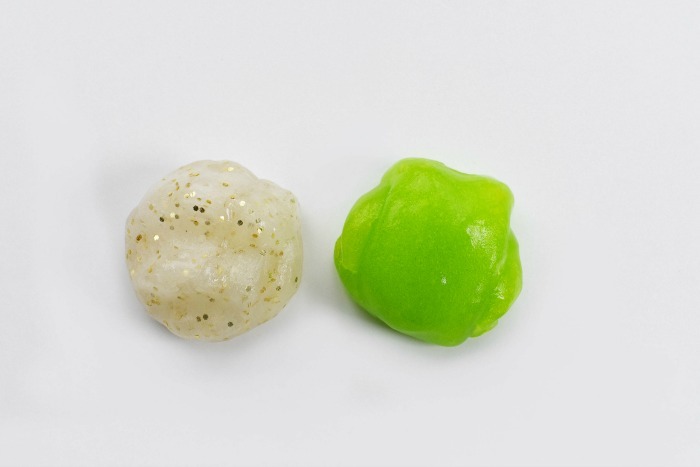 If your slime is too hard or rubbery, you added your Borax and water mixture too fast or it was too hot. Try adding the Borax solution to the glue very slowly and only a little bit at a time. Hot water can also cause the slime to become too hard. Use warm water to dissolve the Borax and let it cool to room temperature before mixing it into the glue. Using too much food coloring can cause your slime to stain your hands or clothes. Only use a few drops of food coloring to avoid this. Store your new batch inside an airtight container. Plastic storage containers or zippered plastic bags work well. We usually store ours in zippered bags. How long does Borax slime last? This type of slime will typically store for 2-3 weeks if you keep it inside an airtight container after your done playing with it. The less air it’s exposed to, the longer it will last. 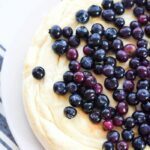 Don’t worry if it doesn’t last too long though, because now you know how easy it is to make another batch! Wondering how to make Slime? 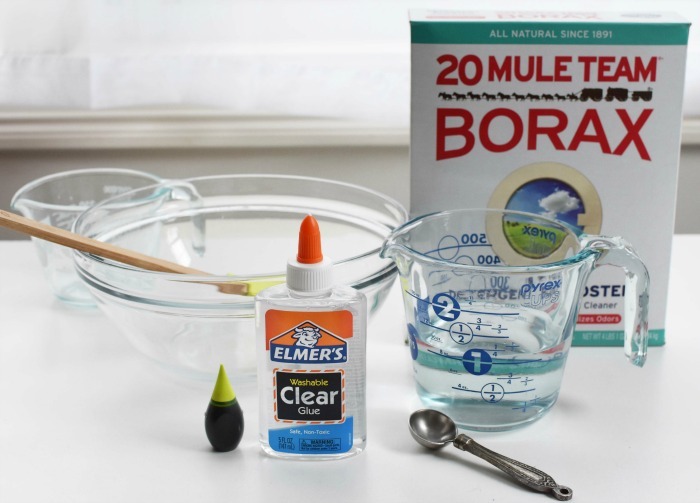 We'll show you how easy it is to make a batch of clear slime using Elmers glue and borax! Mix 1 teaspoon of Borax into the cup of warm water. Mix it until it’s fully dissolved. The water should appear clear and not cloudy. Grab your mixing bowl. Add your 1 cup of clear glue into it. Add a few drops of food coloring and/or glitter to the clear glue and stir gently to combine. 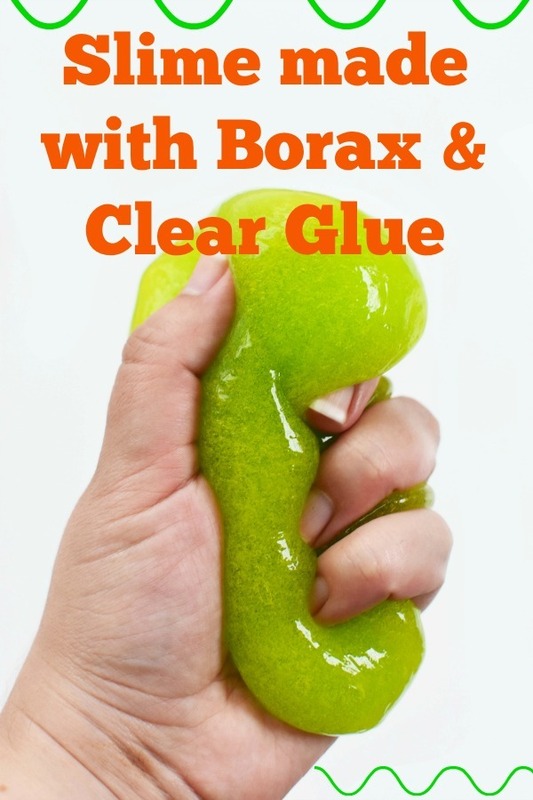 Slowly… add your Borax solution into the clear glue mixture. Add only small amounts at a time while stirring thoroughly, or your slime will harden and you’ll end up with a rubbery mass! You probably won’t need it all. Only add enough until the slime isn’t sticky anymore. ﻿Knead and squish the slime with your hands to finish mixing. 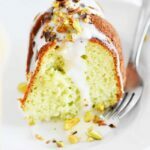 Find out how to make Cloud Dough. It’s soft, moldable, and kids love it! 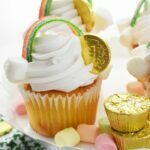 We have a ton of cute and tasty crafts to inspire you on your next project. Be sure to check them out! **See above for disclosure. We only prepare this for our children, and do NOT allow them to do it themselves. We cannot be responsible if your slime does not form. It has failed to work for even us with cheaper alternatives. Previous Post: « Reduced Fat Buffalo Chicken Dip Baked Wonton Cups~Super Delicious Appetizer!! This looks like a fun project my daughter will have a blast with! Fun! This will be a great project for a rainey day! What a great experiment. We had fun! The kids would love this! Pinned ! This didn’t work and it sums! I am sorry it did not work for you, but I assure you it is the correct recipe. Everything has to be exactly as mentioned. Stale or old glue or Borax can affect the reaction to slime. Thank you! 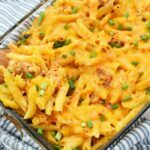 I just used this recipe today and it worked like a charm! So glad I didn’t have to go buy contact solution :).